Doctor Who: Looking Back At WARRIORS OF THE DEEP | Warped Factor - Words in the Key of Geek. There should have been another way, agrees Tony Fyler. More frequently than fans would like in Doctor Who, great ideas have been rendered on screen in a way that undermines the hard work of everyone involved. The Mechanoids, envisioned by Terry Nation as a rival to his own Daleks, were enormous, clunky, and couldn’t be clearly understood when they tried to speak – they were never going to ignite playgrounds in the way the shrieking Daleks had done, with their signature, chilling catchphrase. The Dominators are a fascinating race of aliens, served by some of the silliest-looking robots in Who history, the Quarks. Invasion of the Dinosaurs is a fantastic, barmy idea and a great story – except for the dinosaurs, which look like exactly what they are – toys being shoved about by operators. Even the generally impeccable Terror of the Zygons dices with the death of credibility when it dares to show the Skarasen (that’s Nessie to you) on screen. And then there’s Warriors of the Deep. As a story, Johnny Byrne’s opener for Peter Davison’s third and by far his strongest season (Davison himself has said that if he’d known in advance how strong Season 21 would be, he might have stayed on for Season 22), works brilliantly. In The Silurians and The Sea Devils, the beings it’s now fashionable to call Homo Reptilia were disturbed, threatened, antagonised and ultimately blown up by man, a cogent repeated lesson from Malcolm Hulke to look in the mirror before we dare to cry about our own oppression. Byrne not only intended to bring both branches of the reptilian family together in one story, his story would show them empowered and fighting back, like a beaten slave or a battered wife, to take the fight to humanity before they could be attacked again, evoking the spirit of Hulke’s originals but showing that when you mistreat people, you must expect them to retaliate. It would also act as an anti-war diatribe, with the highest percentage body-count for years, matching The Horror of Fang Rock for its zero survival rate beyond the Tardis regulars. While theorising a dystopian continuation and hardening of the eighties’ cold war for a hundred more years, it would deliver some solid science fiction, in its sea base, its in-orbit sentinels, and its harmonisation of man and machine in the person of a sync operator. As a story, it had everything going for it. Then it came to be produced. The sea base set was chronically overlit, almost hurting the eyes of viewers with its bright white walls and floors. This, if you’re generous, you can explain away – if you lived and worked on the bottom of the ocean, with no contact with the outside world, you’d want your environment to be as bright as possible to combat the gloom and claustrophobia. Of all the Fifth Doctor’s stories though, nothing looks quite as uniquely eighties in style as Warriors of the Deep – the shiny plastic uniforms, the severe eighties hair and make-up, the rather stark simplicity of Nilson and Solow’s treachery – they might as well carry placards around saying ‘I’m a murderous traitor, ask me how.’ With the greatest respect to Ian McCulloch and the wonder that is Ingrid Pitt, their performances here match the make-up, being obvious and nasty. To be fair, Tom Adams as Commander Vorshak appears to have been dropped in from a Gerry Anderson production, he’s so determinedly square-jawed, camera-finding and woodenly heroic. Some of the supporting roles though see actors aiming for and achieving a greater naturalism – Nigel Humphreys as Bulic, Tara Ward’s Preston and Martin Neil’s performance as the scarily fragile Maddox deserving special mention as genuinely helping push the tension and the realism of the piece along. Then there are the reptiles. 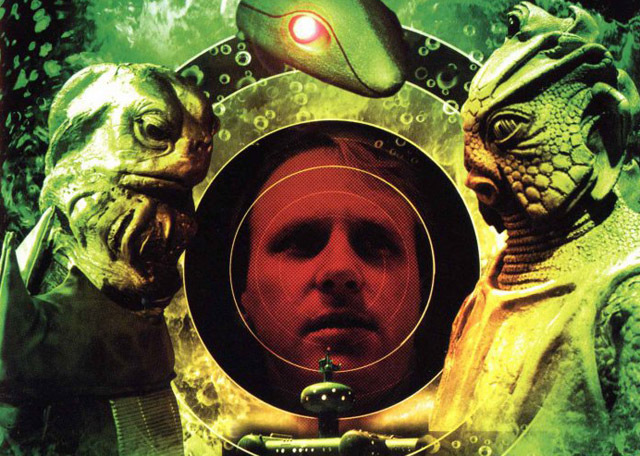 Both the Silurians and Sea Devils got a makeover for Warriors of the Deep, and neither were especially successful. 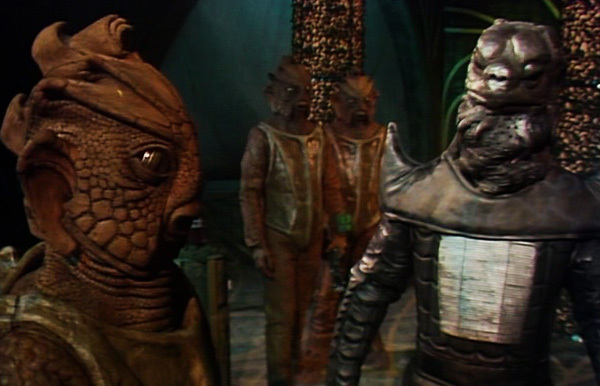 The Silurians appeared to be wearing a kind of bony armour, their faces had evolved from the rather rounded mouths of their previous showing to curved beaks, their arms and legs were clearly creased and wrinkled, which in the overlit set looked appallingly naff and cheap, and – gasp! Most scandalous of all! – their headlight was no longer a weapon, but a kind of pulsing, Dalek-lamp speech indicator. The words from Byrne were great, but the rendering of the 1980s Silurians was bad enough to make you suspend your suspension of disbelief, bringing the whole thing crashing down around your ankles. The Sea Devils on the other hand looked gentler, more like pet tortoises, their gills trimmed down, their skins and eyes darkened. Annnnd then someone thought it would be a good idea to dress them up as Samurai warriors. 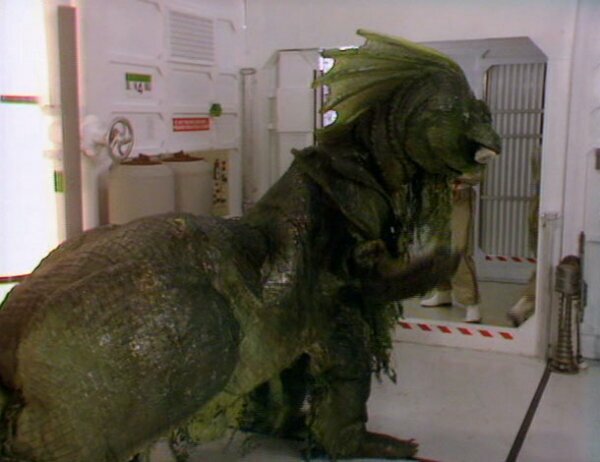 All in all, Warriors of the Deep was not the BBC Costume Department’s finest hour – the reptiles’ costumes were simply bad and occasionally allowed the viewer to see the joins of what were supposed to be reptile skin. The Sea Devil actors couldn’t see particularly well through their head-masks, which meant they moved with a sloth that made them ridiculous as the elite warrior force they were supposed to be (and also that they occasionally bumped into the furniture, and each other. Did we mention the Myrka? Be fair, we’ve got nearly nine hundred words into a review of Warriors of the Deep without mentioning the Myrka. There’s probably a prize to be claimed for that, somewhere in the fandom. The Myrka – the Silurian equivalent of the Zygons’ Skarasen, a giant reptilian killing machine – was unspeakably dreadful. A giant frame, it was operated in the same way as a pantomime horse, and by two of TV’s most accomplished pantomime horse actors (it was the eighties, such people existed), but still – the design was flawed, the actors, by virtue of the costume’s late arrival and more complex shape, were under-rehearsed, and all the Myrka could do was lumber about the place, being dreadful, revealing for every viewer that the door that fell on Tegan was made of polystyrene, and beat Dr Solow in a kick boxing contest. All in that overlit environment, with a surprising lack of imagination in terms of shot-choice from the normally highly skilled director, Pennant Roberts. So many things about the realisation of Warriors of the Deep combined to rob it of the potential of Byrne’s story – the overlighting, the human outfits and make-up, a few highly strained performances, the shoddy redesign and costuming of the reptiles, the shot choices, the Myrka – that it almost becomes too much for the story to bear, opening up Season 21 with what looked like a sixties-budget base under siege story, taking itself as seriously as only the eighties could, and in the full glare of a spotlit studio, having the effect of neon lighting and leaving nothing to the imagination. 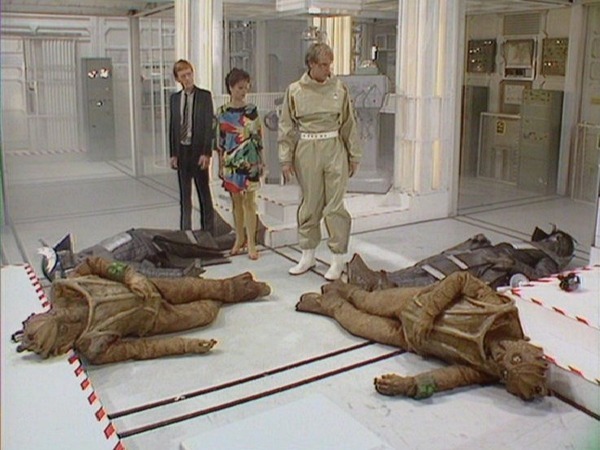 Nevertheless, the ending is tense, with the Doctor having to pit his brain against the sea base computer to avert a nuclear Armageddon, while gassing the reptiles, and while they in turn kill the last remaining humans on the base. It’s an eloquent scene after all that’s come before it, everybody killing everybody, and one man trying to save the world from itself.